It’s here! It’s here! 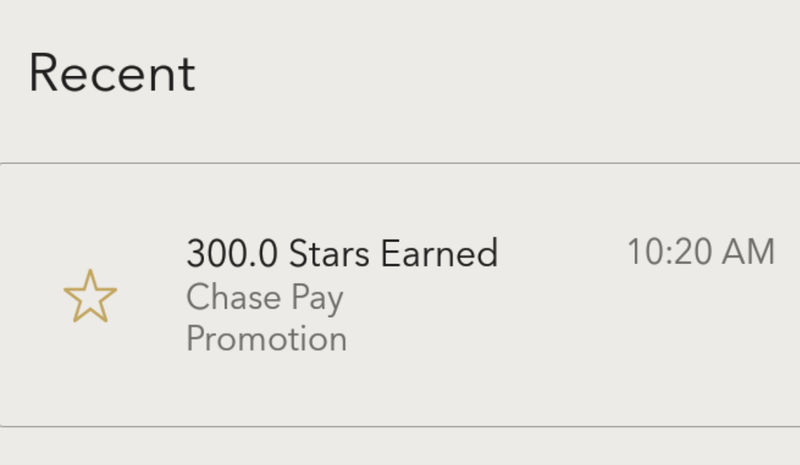 Three days after I used Chase PAY to reload my Starbucks gift card, paid at the register at a participating brick and mortar store, the 300 Bonus has arrived! So as suspected, you don’t have to buy an actual product (and miss out on the bonus stars), a reload of your gift card also counts a purchase. This is a super hot deal if you are participating in the Starbucks Rewards program AND are using (or do not object to start using) Chase Pay, Chase’s mobile payment method. 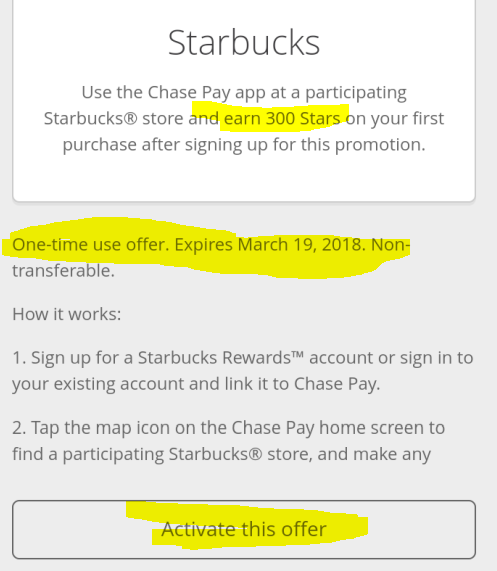 The offer gets you 300 Bonus Stars if you make a purchase at a Starbucks brick and mortar store using the Chase PAY app by March 19 in 2018. But first, you must activate the offer in the ChasePAY app. Activating the offer also links your ChasePAY account with your Starbucks Rewards account, so have the Starbucks password ready because you have to login to connect them. Chase Q1 2018 5% Cashback Rewards are Epic! Chase is taking their 5% cashback bonus categories for the first quarter of 2018 to the next level! 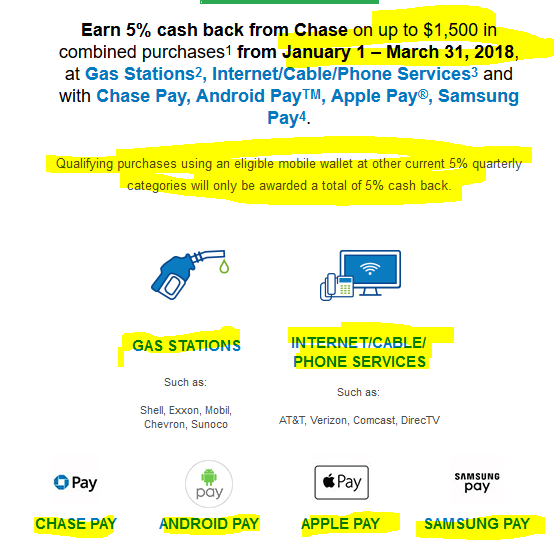 Not only you have specific 5% earning product categories (gas stations, internet, cable, and phone services) BUT you will also earn 5% on purchases made with the three major mobile wallets, along with Chase’s own ChasePAY. That’s right, all Android PAY, Apple PAY, and Samsung PAY purchases get you 5%! The limit is the same as always, up to $1500 for the quarter will earn 5%. Everything after that will earn at the standard 1% cashback. The limit is per card, so if you have multiple Chase cards, make sure you activate the offers on all of them, and plan your purchase so you can max out each one of them! It’s certainly not hard to get $1500 just with gas and internet and phone and cable for a household, the way prices are going up on all of them! But if you have additional cards, or you are still under $1500, then the four mobile wallets will certainly get you to $1500+! Since nowadays most major chain stores accept one of those mobile payment methods, just about everything, from groceries to drugstore purchases can get you that 5%! 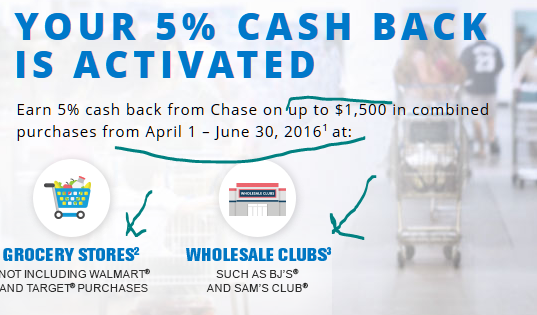 And Chase’s 5% can be converted straight up (1 point = 1 cent) to cash or statement credit. It’s not like the AMEX Membership Points that you get less than that. PS: further strategizing, if you have a Discover credit card, their Q1 2018 5% cashback rewards include gas stations, so you could off-load your gas purchases to Discover, and use your Chase for everything else. UPDATE: here is the Complete List of participating merchants AND exclusions from Chase itself! Everybody loves eating, well, at least has to eat, so if you have a Chase credit card that is participating in the 5% Cashback Bonus rewards, make sure you activate the 3rd Quarter promotion, running between July 1st until September 30 in 2017. 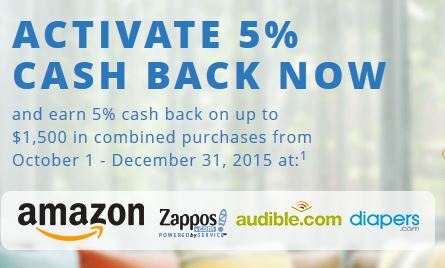 You earn 5% back in cashback in Restaurants and Movie Theaters! As usual, there is a maximum of $1500 spending per credit card. Meaning the first $1500 during the quarter you spend in Restaurant and Movies will earn 5% cashback. Any purchases over $1500 during the quarter will earn the standard 1% cashback instead. The good thing though is that the $1500 limit is per credit card, not per person. So if you have two or more of these credit cards, you can max out at $1500 per credit card. Don’t you dare miss the second quarter 5% Chase Freedom cashback rewards bonus offers! They offer two very popular categories that almost every person spends money on! Grocery stores and Drugstores! You get 5% on up to $1500 spending on those two categories between April 1st and June 30 in 2017! The $1500 total is on both categories, not each category. However, if you have multiple Chase Freedom credit cards (Chase has been buying other small credit card companies left and merging them into their own), the amount is $1500 per card for the quarter. 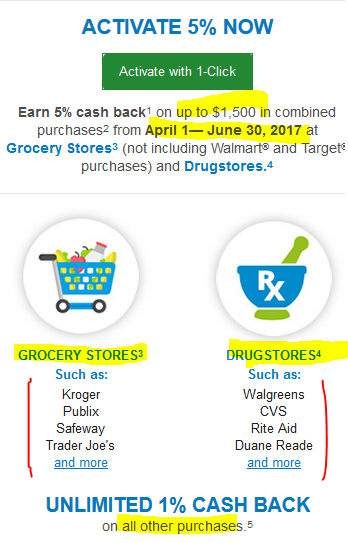 As you can see from their promotion, a lot of popular stores are participating in this promotion, both on the grocery and the drugstore front! This is a very good deal if you are part of the Starbucks Rewards program. 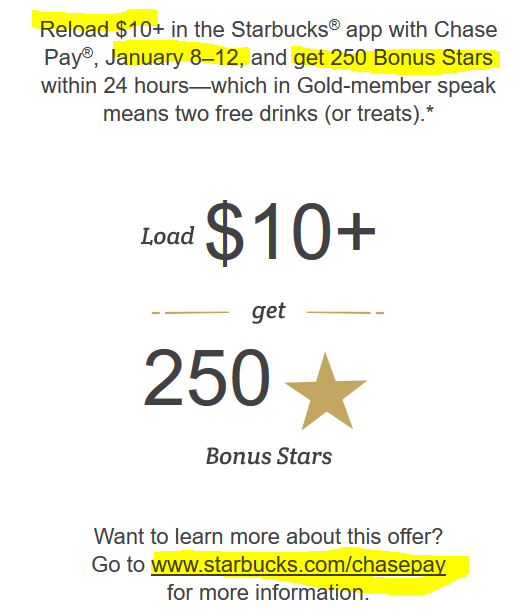 If you load your Starbucks gift card balance with $10 or more using Chase Pay (Chase’s mobile payment service), you will receive 250 Bonus Stars, which are Two Rewards. You can easily redeem these rewards for items that cost $6 or more (bistro boxes, loaded drinks, sandwiches, etc), so this is better than a B1G1! Offer runs January 8-12 in 2017. I haven’t done this promotion yet, and I haven’t used ChasePAY before, so I’ll update this after sign-up for this offer on Monday 1/9/17. STAY TUNED…. Last but not least are the Drugstores, another place of frequent purchases. With all these categories, it’s not hard to reach the quarterly limit of $1500, so plan your purchases according to the various credit card rewards to max out the benefits. Remember the $1500 limit is per credit card, not per person, so if you have two Chase Freedoms, it’s $1500 per card. The other nice thing Chase does is that you can retroactive earn rewards going back to October 1st even if you active now. There is a deadline before the end of the quarter to activate, but it is very generous. I always pre-activate before the new quarter begins, so I haven’t tested this yet. But they mention it prominently in their FAQs and such. Here’s the big picture of their 2016 quarterly categories, but keep in mind, there’s no guarantee the exact same line-up will appear in 2017. There’s typically some overlap, but they move things around as well. The third quarter of 2016 is looking to be another hot one for Chase Freedom Rewards member. Their 5% cashback categories, with the usual $1500 purchase cap, are Restaurants and Wholesale Clubs which includes Costco, Sam’s Club and BJ’s. As usual, restaurants include a variety, from fast food to fancy restaurants, and in previous iteration, this also included some semi-restaurants, like Starbucks. You can begin earning these 5% rewards between July 1st and September 30 in 2016. You can activate the promotion now, but the earnings in these categories begin July 1st. 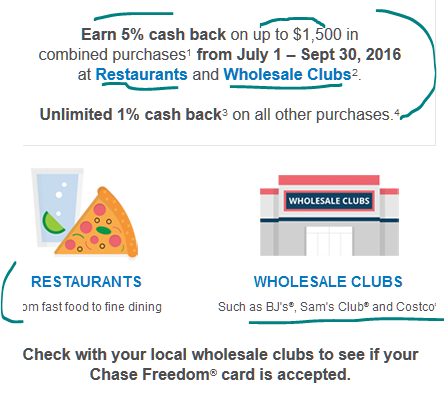 Strategically this works great, because for the second quarter (ending June 30, 2016), you are earning 5% at Restaurants with Discover and Grocery Stores and Wholesale clubs with Chase. 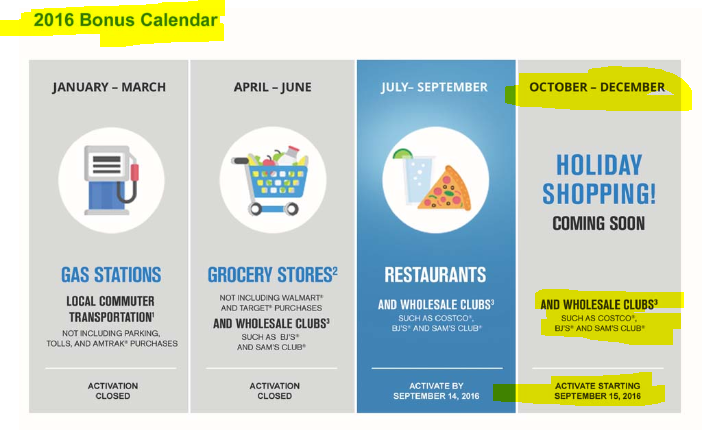 In other words, the Wholesale club promotion continues this quarter as well. NOTE that for WholeSale Clubs, certain purchases (gas/fuel and specialty services) are NOT eligible. If not sure, contact Chase or do a trial-and-error thing by doing the math on your statement. If you have multiple Chase Freedom credit card, each one has a limit of $1500 in purchases. In other words, the maximum reward you will earn from this promotion during a calendar quarter is $75 (5% of $1500). Any orders above $1500 in those categories will simply earn the usual 1% cashback. So if you have multiple cards, strategically split your orders between them if you are anywhere near the quarterly limits. UPDATE: Chase has a list of eligible Restaurants, of interest if you are wondering whether your favorite chain stores are eligible. Independent and individual restaurants are NOT listed there but they are eligible. It’s September 15, and this means, among many other things, you can now activate your 5% Chase Ultimate Rewards categories for the fourth quarter of 2015 (October 1st until December 31st). As usual, the quarterly limit is $1500 in eligible purchases. After that, you earn the standard reward amount (1% in most cases). 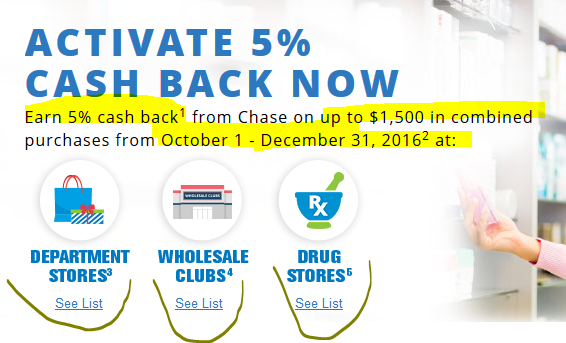 You can easily activate them when you login to your Chase account, in the summary page, there is an “Activate Now” button in the “5% Cash Back status” line for every eligible card in your account. You have to do this for each card. The 4th quarter is very Amazon-centric as it features purchases at Amazon, Zappos, Diapers and Audible, all original or purchased Amazon companies. Speaking of rewards, don’t forget to also activate your Discover Q4 rewards which also include Amazon, along with various department stores and clothing stores. Strategically, depending on your purchases, you may want to use Discover for the department/clothing stores and shift the Amazon purchases to the Chase card. That’s if you are going to get close to the $1500 limits (for the 5% rewards).